Unfinished Beds Beds That Come Unfinished. You will be able to finished it in your own color or stain. Beds That Come Unfinished. You will be able to finished it in your own color or stain. The Daybed bed frame is made of smooth, clean, unfinished poplar hardwood, not pine. Many of the pine frames on the market have a rough splintery feel. Pine averages 18% moisture content, our hardwood is kiln dried to 8%, which means it is far less likely to split or warp. This pure untreated wood is preferred by many consumers seeking a natural, hypo-allergenic alternative to todays chemical laden products. 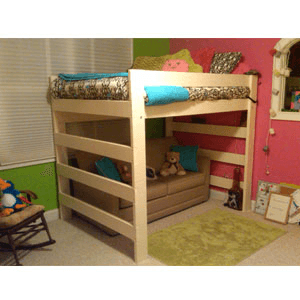 Frame Features: ï¿½ Stands 23 inches tall (including mattress. mattress not included in the price). ï¿½ Detailed assembly instructions. ï¿½ Full 5 year warranty. ï¿½ Made with pride in the USA. ï¿½ Optional drawers available. ï¿½ Smooth wood -planed on 4 sides. ï¿½ Rounded edges -no sharp corners. ï¿½ Kiln dried to 8% moisture content. Dimensions: 76.5 In. (L) x 40 In. (W) x 32 In. (H) ï¿½ Takes stain well or beautiful as is.